Problems with the foot skin? They might occur as a result of various reasons, some of which are: dry and inflamed skin, incapacitated blood circulation, diabetes, lack of physical activity, or the opposite – active sport and overload. Regardless of their origin, we do know how unpleasant those issues are! With one little step in the daily care, the discomfort and the awkward moments can remain in the past. 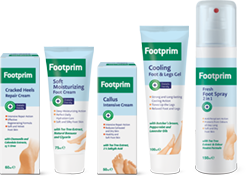 In order to have beautiful and healthy feet every day, Footprim offers products, which provide solutions of the most common problems. The desired result is possible with very little effort. The Footprim products work with an effective combination of specially selected ingredients and natural extracts and oils. Each formula is carefully developed with consideration to the needs of the skin, suffering from a particular problem. Through the Glycerin, Lanolin, Allantoin, and 25% Urea, the skin is nourished and restored. The Tea Tree, Calendula, Chamomile and Butcher`s Broom Extracts and the Mind and Lavender Oils provide natural care. Those are just part of the ingredients – for further information you can read the description of every product. All of the products are easy and pleasant to use. A reasonable and effective solution for every day.